DISCONNECT AND DEEPEN YOUR YOGA PRACTICE IN PARADISE - ALL LEVELS OF YOGA VERY WELCOME. At Santa catalina retreats, our yoga style includes Hatha, Vinyasa, ashtanga and Kundalini. Focusing on the breath, fundamental postures and having fun playing with new challenges. All levels are welcome as our instructors will adapt poses to suit your ability. Nikki came to yoga in 2012, drawn by the strength, grace and physical challenge of yoga and a desire to forge a path to peace and happiness in her life. She quickly fell in love with the practice and how it enriched all facets of her life - physical, mental, spiritual and philosophical. As a teacher she is passionate about providing space, permission and guidance for her students to connect with and listen to their own bodies and what they need in the moment, while challenging them to step into, or out of, discomfort when it serves. To that teaching style she adds her love of fiery and challenging Vinyasa, arm balances, playful transitions, and the time and space to experience the breath and be present in the body, despite distractions of the mind. Nikki is a full time yoga teacher, Lululemon Ambassador and published author. This dynamic and creative side of Nikki emanates through her classes. Eva´s spiritual journey began in 2000 after completing her university degree in History of Art. What should have lasted 1 year initially, ended up a life-changing experience. Yoga, that was initially a self-practice to stretch after surfing, became part of her daily routine as she learned from many masters. This took her to India in 2010, where she fell deeper into the practice, leading her to take a Yoga Teacher Training Certificate in Satyananda Ashram in Nasik, Mumbai. here she not only mastered her yoga practice but also deepened into meditation and a yogic lifestyle. Kimilla is a yoga teacher and surfer, living by the ocean in Byron Bay, Australia. Raised in a pristine place, Kimilla discovered yoga as a child and like surfing, it spoke directly to her heart. Yoga was her saving grace during her teenage years and at age 20 in Sri Lanka began the desire to share and teach yoga. Born in Brazil, Fabi spent part of her childhood in South Africa & India. Fabi has always been drawn by the elements of Nature to heal her body and nourish her soul, and has been encouraged to embody movement in different creative expressions and exercises which allowed her to develop great body awareness and understanding. She believes her personal essence resonates lightness integrated with loving kindness and supportive strength. Following her instincts, she has never stopped studying and considers sharing her knowledge to be a true gift and a blessing on its own. fabi is a bilingual Holistic Therapist, Functional Sports Nutritionist, Naturopath and Mindfulness facilitator with an extensive healthcare experience of over a decade and a solid background in yoga, mindfulness & wellbeing. As a yoga teacher she is RYT 200hr trained in Ashtanga Vinyasa, Hatha and Yin by schools in India and Australia since 2015 and is currently undergoing further training in New York (ISHTA Yoga) for her advanced 500hr certification in Hatha Yoga, Ayurveda and Tantra. 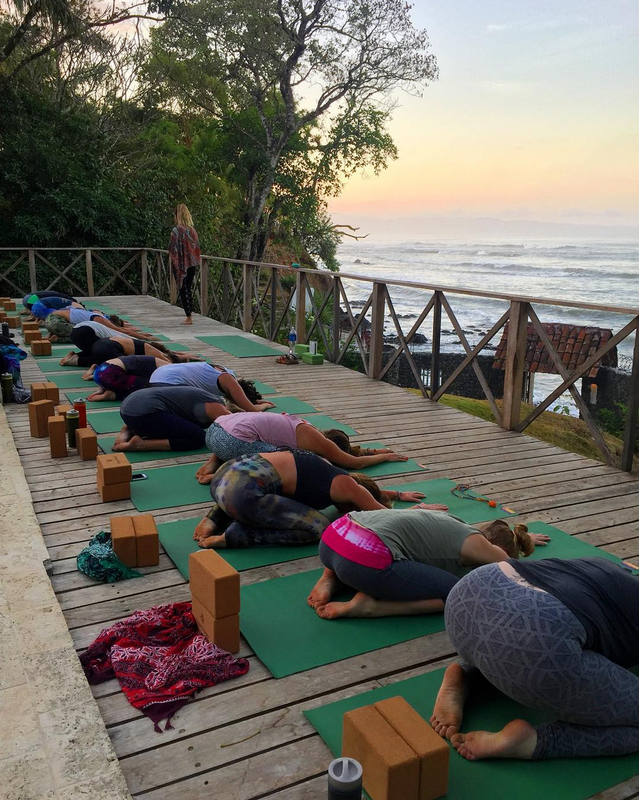 Michelle has been practicing Yoga for over 20 years and teaching yoga and leading retreats since 2007. her travels taking her all over the globe from jamaica, Costa Rica, Mexico, Italy and Panama. michelle teaches an integrated Vinyasa practice focused on proper alignment and building core strength. Focusing on proper alignment helps her students tao into the metaphysical benefits of the practice. Her style fuses her training in traditional Hatha yoga schools – Iyengar and Ashtanga – with her training in Core Strength Vinyasa Flow. Michelle brings a deep meditation practice to her classes as well having studied many forms of Buddhist and Hindu meditation. she has studied and practiced in some of the top yoga studios in New York City and continues to train under some of the leaders in the field. Michelle also teaches yoga in some of the top corporations in NYC which brings yoga and mindfulness to the workplace through Balance Integration. she also brings an impressive playlist to each class and an incredible sense of humor and intellect. her classes are always loved by all! MEET CANDACE - 500 RYT HATHA,, CHILDREN’S YOGA, PRENATAL YOGA + MINDFULNESS. STUDIO OWNER - SOUTHTOWN YOGA, FOUNDER - ELEPHANT POWER: MINDFULNESS AND YOGA FOR KIDS. Candace’s rich teachings are informed by the knowledge, experience, and wisdom that over 20 years of teacher experience provides. She continues to teach children, educators, and yoga practitioners and those who want to teach yoga. Eager to help others develop a mindfulness practice, Cydney is also the founder and CEO of Colors of Ohm, a non-profit organization working to bridge the gap between people of color and wellness opportunities through mindfulness workshops and yoga retreats. Student of Yoga. Passionate about oriental philosophies such as Taoism, Buddhism, Zen and Tantra. Began his path into Yoga in 2012 with the practice of sitting meditation, later experimenting Viniyoga, Power Yoga, Vinyasa Flow, Hatha Yoga and eventually Ashtanga Yoga. Completed a 200 hour Ashtanga Vinyasa teacher training program under ‘It’s Yoga International’ in early 2015 and has been practicing the method committedly ever since, complementing his studies under the guidance of experienced teachers such as Mariela Cruz (Costa Rica), Krista Shirley (USA), Day Christensen (USA), Michel Guiou (USA), Kristina Karitinou (Greece), Hamish Hendry (England) & Barbara Süss (Austria). In 2016, he completed a month long trip to Mysore, India to practice under the guidance of R. Sharath Jois at the KPJAYI (Krishna Pattabhi Jois Ashtanga Yoga Institute). Aurora is a certified Vinyasa Yoga instructor with a deep practice in both Ashtanga and Vinyasa Yoga. Aurora has had the opportunity to study with great teachers including; Seane Corn, Melanie Fawer, Nathalie Croix, Bryce Yoga, Day Christensen, Kino Mc Gregor, and Mariela Cruz. Aurora embodies a deep respect for the tradition and lineage of Yoga, which is experienced through her classes. Her classes are a blend of alignment based asana practice, spirituality, energy work, and meditation. Aurora has been able to share her knowledge in the US and Panama; in studios, private classes, public events, workshops, and retreats.